"NBA 2K1 is the second installment of the NBA 2K series. It was developed by Visual Concepts and published by SEGA (as Sega Sports). 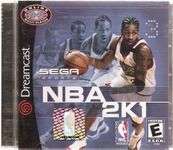 It was the first NBA 2K game to feature online multiplayer and the first game to feature street courses instead of playing a game inside the stadium in the first game, famous street courts such as The Cage, Rucker Park, Franklin Park, and the Goat Park. It was released on November 1, 2000 in North America with the Dreamcast." Source: Wikipedia, "NBA_2K1," available under the CC-BY-SA License.